The Ontario Energy Board has approved three pilot projects that would increase the peak period electricity rate, and further lower the off-peak price, ostensibly to give customers a stronger incentive to cut peak period usage. The province is also considering giving Ontarians free “smart thermostats” to help them move their electricity consumption off peak, to times of lower prices. The first problem with this scheme is that most households simply cannot shift their power consumption to the middle of the night, so any increase in daytime rates will just add more to the already-crushing burden of inflated electricity bills. The second is that those smart thermostats won't actually be free—taxpayers will be on the hook for them. But what about the underlying logic of varying prices by time of day in order to account for scarcity? Isn't this simply a reflection of economic logic? No, because electricity is not scarce in Ontario—in fact, Ontario has surplus power (especially from wind) that it sells to the United States at a loss, as we documented here. The auditor general of Ontario estimates that the province has already lost close to $2 billion on such exports. Data from the Independent Electricity System Operator shows Ontario now loses, on average, $24,000 per operating hour on such sales, totaling $200 million annually. Since 2005, Ontario customers have unwittingly paid $6.3 billion to cover the cost of selling the province’s surplus electricity to customers in neighbouring states and provinces. Most of that bill—$5.8 billion, or nearly $1,200 for every household in the province—has been incurred since 2009, as demand for electricity in Ontario has declined, while generation capacity in the province has continued to grow. 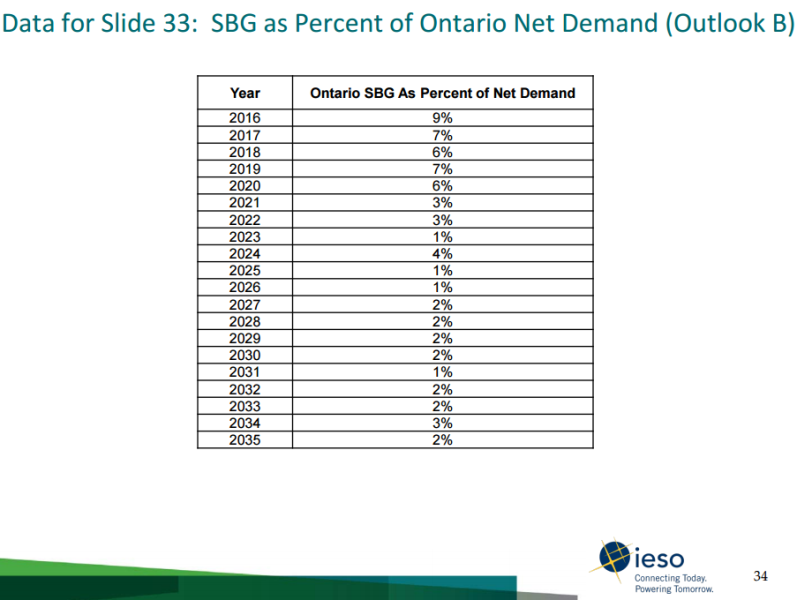 Surplus baseload generation (SBG) is expected to continue out to 2035, according to the Environmental Commissioner of Ontario (see chart below). Making matters worse, because of the way the Global Adjustment is calculated, as electricity consumption declines, the surcharge per kilowatt has to go up to yield the revenue required to meet government funding commitments. So even if the pricing experiment yields lower overall power consumption, it will increase the Global Adjustment and force Ontario power prices yet higher. So how is this an auspicious time to be convincing consumers to shift off-peak? As we have written elsewhere, what Ontario needs are real reforms that will actually bring electricity prices down, not kick them down the road to the grandkids, not kicking them elsewhere in Ontario’s tax revenues, and not offering consumers a false economy of buying their power off peak at a lower cost, while most of their power gets even costlier and their taxes likely rise to make up for the lower revenues of Ontario’s power producers. And also pay for that “free” smart thermostat.